Geologic events that alter environments change the course of biologic history. The formation and subsequent breakup of the super continent Pangea for example affected the diversity of life immensely. The evolution of life conversely affects the planet it inhabits. The evolution of photosynthetic organisms is a primary example of this by releasing oxygen into the earth's atmosphere, in turn altering the earth's atmosphere. Until the last few decades the absence of the precambrian fossil record puzzled palaeontologists and geologist until the discovery of microscopic fossils of Prokaryotes. Prokaryotes originated within a few hundred million years after Earth's crust cooled and solidified. There have been mineral found that crystallized approximately 4.1 Billion years ago (BA) and sedimentary rocks that date to 3.8 BA, the fossil record does not date back that far. However, Prokaryote fossils have been discovered in southern Africa that date to 3.4 BA in the Chert of the Fig Tree Formation. 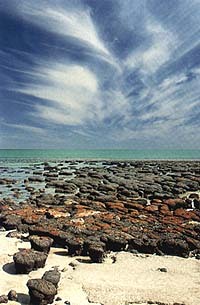 Evidence of even more ancient life has also been found in rocks that are called Stromatolites. Stromatolites are organo-sedimentary structures produced by sediment trapping, binding and/or precipitation as a result of the growth and metabolic activity of micro-organisms, principally cyanobacteria (Prokaryotes). They form banded domes of sediment, and are very similar to layer mats constructed by cyanobacteria alive today in salt marshes (the present is the key to the past). The layers are created by sediments that stick to the jellylike coats of motile microbes, that continually migrate out of one layer of sediment and for a new one above, producing a banded pattern.